I’ve been working on the labels for the batch of wine Bruce and I are making. We went to San Antonio for our 4th Anniversary which was back on July 18th. We had heard from one of the couples on our dock, about a place called Water 2 Wine. We decided to go check it out. 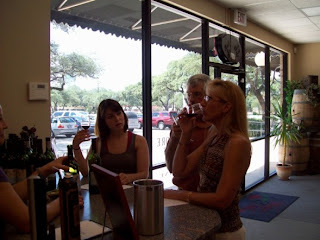 First we had a wine tasting. Bruce and I had discussed it before hand and had narrowed it down to three preferences: Merlot, Cabernet Sauvignon, or Shiraz from Washington, Chile, or Australia. So we began by tasting all they had along those lines. We did venture out and taste other things they had, but our uncontested favorite ended up being a Cabernet Sauvignon-Shiraz blend from Australia. 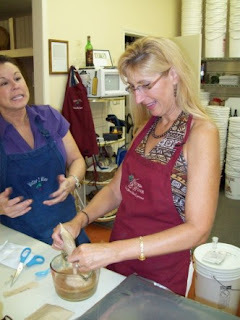 Next, we put on aprons and got started. It’s appallingly easy to make a batch of wine. Sadly we didn’t get to mush the grapes ourselves. They come in a bladder full of juice made from the grape of your choice. 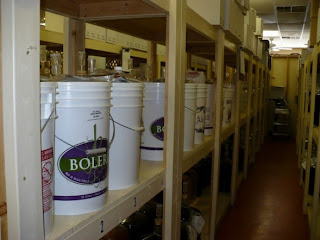 I guess there are different additives depending upon which wine you choose, but the ingredients in our wine were few. 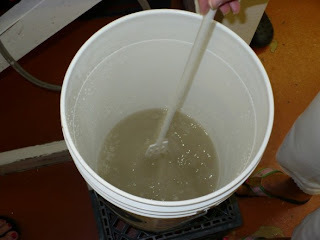 We began by putting about 2 to 3 inches of water in the bottom of a plastic pickle bucket. Next, we added a small packet of grey powder, which is essentially clay, to serve as a “base” and mixed it very well with a paddle. Meanwhile, we were hydrating 2 pouches of oak chips. One was practically sawdust, the other would make a very nice landscaping mulch. 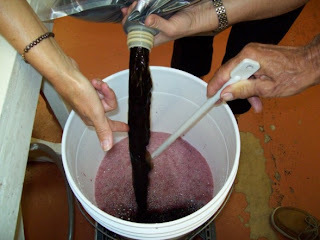 The grape juice, which was rather concentrated, went into the bucket next. Once the oak chips had been soaked in hot water for a few minutes, we added them to the juice, mixing constantly. The oak chips give the wine that oak flavor that was once derived from being aged in oaken barrels. The “hint of oak’ flavor in wines is really just that… the flavor of oak! The sugar level was tested and a bit more water was added. Then I sprinkled a small packet of yeast over the top of it all and that was it for now. We then put on the lid, which had a little device which allowed the wine to burp without air coming in. Our wine will sit for 45 days during which our tender will strain it a couple of times. Late in the process, she will add the sulfites as preservative. Only a small amount as Water 2 Wine prides themselves that their wines contain lower levels of sulfites as compared to shelf wines. This is the ingredient that can give you that “wine headache”. The last ingredient to be added will stop the fermentation process and that’s it! We have chosen to make 2 different labels. One will feature our sailboat, Elan, and the other will have the picture of a little yellow warbler that came to play with us on one of our short offshore jaunts a few months ago. I emailed the pictures in yesterday and eagerly await the label proofs. We go back on September 6th for a bottling party. I can’t wait to see how it turns out!